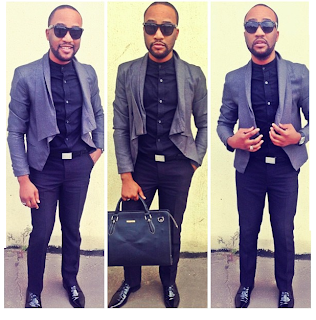 Saw this picture of Dayo Ephraim on his Instagram page. I just really had to post it. The Hip TV Star teamed a high collar black shirt with a black pant and a pair of black shoes with this beautiful Gray Blazer to Church on Sunday. . I just love the way he styled himself. In one word, Classy. And that bag... Gorgeous.